Mrs. Eluska has served on the Board of Directors for six years, where she currently serves as Secretary. Mrs. Anderson is half Alutiiq and half Navajo. 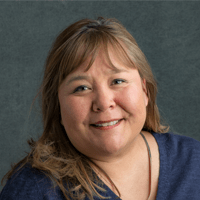 She has served on the Alaska State Chamber of Commerce, Alaska Airman’s Association, and for Linc Energy’s community relations events for villages of Nuiqsut and Anaktuvuk Pass. She also serves as the manager of Shareholder Relations for AKI.